6.- BANJERS' MAIN SIMPLE PARAMETERS. 7.- RUDDER, LATERAL & HULL's SUBMERGED AREA. The engines originally mounted on the Banjer 37 were either Perkins 4-236M (62 BHP continuous) or Perkins T 6-354M, 95 BHP-6 cyl. version. Find more about Perkins-Sabre, world-wide distributors and services by clicking the name. Perkins 4-236M series may go up to 85 HP SAE (63 kW or 86 metric HP). You'll find an useful Forum at Boatdiesel.com/Forums, with active forums for Perkins 4-236M and 6-354M Series. Boatdiesel also has some useful calculators for Propellers, Power required ans Shafts, as well as engines specifations. You need to become a member to use this service. You may also find a handbook for 4.212, 4.236 & 4.248 series at: http://motoren.ath.cx/ Search for Perkins in the left frame. A couple of years ago I spoke to Mr and Mrs Yates in a English harbour about Banjers and Perkins engines. This week I found the card with the adress. I talked to Mr Childs - who is 78 - and he does have vast stocks of engines, blocks and parts. No website. No email. But his 24hrs a day fax number is 0044 (0) 1733 844769. This seems the best way to make contact! Most Banjers mount Paragon 25L with Perkins 4236 and Paragon 35L with Perkins 6354. Reductions 3:1 both cases. We thought Paragon Transmissions were not anymore in production, but Doug Frank, General Manager of Great Lakes Powers , the Original Equipment Manufacturer for the Paragon Marine Transmission, formerly The Paragon Gear Works of Tauton, Massachusetts, tells us: "We still continue to manufacture product for the Paragon units. We can still provide a complete unit depending on the model. We can provide for most units complete seal and gasket kits as well as clutch plates, bearings, brake bands, etc." He has a workshop in his garden with everything you can imagen concerning paragon gearboxes, new and overhauled"
We are searching for more World wide marine parts companies also working Paragon. If you know one, let us know. Possible alternative gearboxes for your Paragon P25 (Mounted with Perkins 4236). You should adjust the pitch of your propeller to suit new gearbox. before attempting a transmission gear change over. INTO NEUTRAL BEFORE THE ENGINE IS SHUT DOWN". "The Paragon P25L has tapered roller bearings at the output shaft to accept propeller thrust. The maximum gasoline pleasure craft rating of the P25L is 220 HP at 4000 RPM. The output bearings were selected to handle the propeller thrust produced by this maximum application. The thrust produced by this Banjer 37 application can be adequately handled by the tapered roller bearings in the Paragon P25L transmission". So, folks which's Banjer mounts this gearbox (And most probably the Paragon 35 also): The shaft bearing located at the rear bulkhead of your Banjers is of no use, and you'd better remove it, in my humble opinion, because can cause alignation, vibrations and heating problems in the shaft. 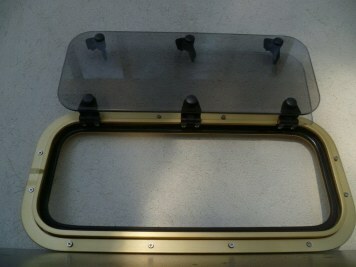 OIL COOLER, P/N 11829, WAS GENERALLY RECOMMENDED FOR THE 200 SERIESTRANSMISSIONS ESPECIALLY IN PLEASURE BOAT APPLICATION. THIS COOLER HAS A NOMINAL SIZE OF 2 X 5 INCHES. WE DO NOT HAVE A REPRESENTATIVE IN SPAIN. FOR MOST EUROPEAN INQUIRIES, WE RECOMMEND OUR MASTER DISTRIBUTOR IN THE NETHERLANDS, KEMPER EN VAN TWIST DIESEL BV. THEY CAN BE FOUND ON THE INTERNET AT: //www.kvt.nl/ THEIR PARTS MANAGER IS JACK WEIJTS. IT IS POSSIBLE THAT KEMPER MIGHT HAVE OTHER OPTIONS AVAILABLE FOR YOU. IF ANY QUSTIONS, PLEASE DIRECT THEM TO US ANY TIME. THANK YOU FOR YOUR INQUIRY AND INTEREST. COOLERS ARE PRESSURE TESTED BY THEIR MANUFACTURER AT 200 PSI FOR THE TUBES AND 250 PSI FOR THE SHELL. This firm in Sweden, seeming not anymore at work, was the manufacturer of the steering system. This system is type HL4, Manufacturing number 333. Interested fellowmembers can get a copy of the original booklet about this system, from Guillermo. Our fellow member Maarten tells us that PROMAC used to serve the Seffle steering gear in Holland and abroad. 13.07.05: Colin Whimster informs about a press release confirming that the trade of Sheffle has been taken over by Promac. Amitiés bonjour à tous DAMY 3 "
I want to tell you that we have renamed ANNE MARIE to TIJDVERDRIJF. Promac could not fix my Seffle steering gear (they are very helpful), so I replaced by a Vetus MTC175 and pump HTP4210r and working both excellent, I think 2 turn less . 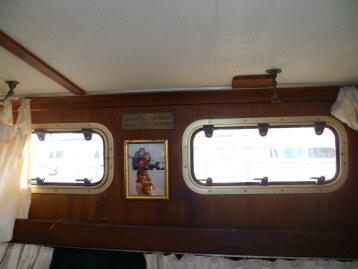 One of the original manufacturers for Banjers' portholes and wheelhouse windows is still at work. You can find they page by clicking the name upwards. PANDORA inform us from Cyprus about the GEBO manufacturer, who also produces portholes and windows for the Banjers. International Steel Supplies Inc. is the original firm, at 's-Hertogenbosch, NL, where most of the stainless steel parts of Banjers were made. They are still at work but seem to be oriented nowadays towards industrial markets, rather than boating. Banjers mounted a Blake-Lavac-Taylors paraffin cooker with oven and many even mounted also Taylors paraffin heaters. Here you have their home. Banjers Fresh Water Pressure System included an electrical diaphragm pump from Jabsco. The heads were from Raritan. You'll still can find parts from them for the old models. Note: Gas water heaters are not any more allowed for cabin installation, under the CE Recreational Craft Directive. The first VHF sets mounted on board Banjers were those rugged and reliable Sailor radios with a dialing channel selector. 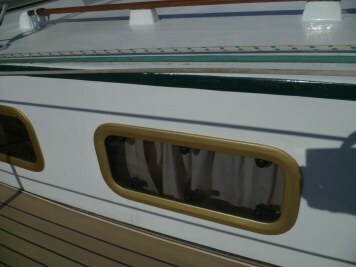 The Banjers' decks were covered with this excellent diamond-pattern anti-slip product. Air heaters were optional in Banjers, made by this UK company. "When Simpson Lawrence of Glasgow went out of business some products were taken over by Lewmar but someone who had worked at SL bought a lot of the spares. He is John McMaster and he lives near Glasgow. Rules to choose the Anchoring Tackle has been, till recent times, a matter of experience and sometimes even a matter of wisdom and wishful tinking. 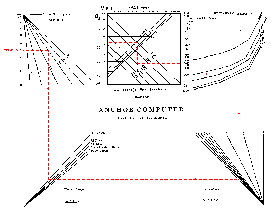 Rules and Regulations of the several Classification Societies allowed (and still do) for simple formulae to choose a ships' tackle, based mainly in Britany style anchors and all chain rodes. As those are empirical, based on many ship's tests, thousand of feedbacks from the industry, and only consider good mud and sand bottoms as those found in the charts' anchoring spots, results are quite similar from one Society to the other. Nowadays engineers have powerful and precise calculating methods, used to design case to case permanent anchoring tackles for big floating structures as oil rigs, etc. Working and fishing boats usually do not anchor, simply because they do not need to, excepting in specific situations not highly demanding. So anchoring is an skill not mastered at all by most of the professionals in these fields. All fishermen I know through my professional activity only know and use the local variation of the grapnel anchor, good only for rocky bottoms. Yatching is probably the most demanding field for anchoring techniques and equipment, because of the variety of bottoms, weather and other anchoring spots conditions. But until recent times it was based on simple 'rule of thumb' or semi-scientific methods. A more scientific approach is taken nowadays by designers, as well as several independent studies have being performed. But again the not standarized tests conditions make it difficult to obtain general conclusions, although well stablished myths are falling quickly down. Many owners still doubt, feel confused or believe they do not have enough knowledge when choosing their anchoring tackle, being to them the best source of information the feedback from the cruising community, through Forums, etc. Just to try to help fellowmembers of the Banjer 37 Motorsailer Club to better choose their equipment or judge the existing one, I'll navigate through all (to me) available information, post it here, analize it, and then, with the help of other experienced members, try to arrive to some conclusions and recomendations to be used in our beloved Banjers. I'd very much appreciate all contributions. First let's have a look about what has to be taken in account when designing an anchor. I find these pages useful to this end. From the pages of the Dutch firm Vryhof Ankers, specialized in big anchors for the offshore industry. "We are all aware that real-world anchoring is more complex than an idealized mathematical model or lab test..."
"An anchor rode is not an straight link between the bow and the anchor..."
Includes an useful Anchor Catenary Calculator. The Sailing Foundation Anchor Tests. Puget Sound 1995. "Of the anchors tested, only five passed the threshold of 1,000 lbs. and only four could arguably pass as storm anchors. The holding power of those four exceeded storm anchor requirements, but failed to do so on a consistent basis." "It would seem preferable for an anchor to not set than to set and hold at only moderate conditions"
"Anchors which come highly recommended, even those which are successful in the marketplace, may not perform in the real world." "These tests were conducted in order to establish a reliable, controlled database for comparing the performance of various popular recreational marine anchors in soft muddy sea floor conditions." From this Test Series, we can conclude that for soft mud bottoms, we should use devotedly designed anchors, as the Fortress FX, set at 45º. They have holding power/weight ratios around 100, which is outstanding. On the other hand it seems to be clear that plow type anchors, as CQR, Bruce, Delta and the like, are not good for soft mud bottoms. 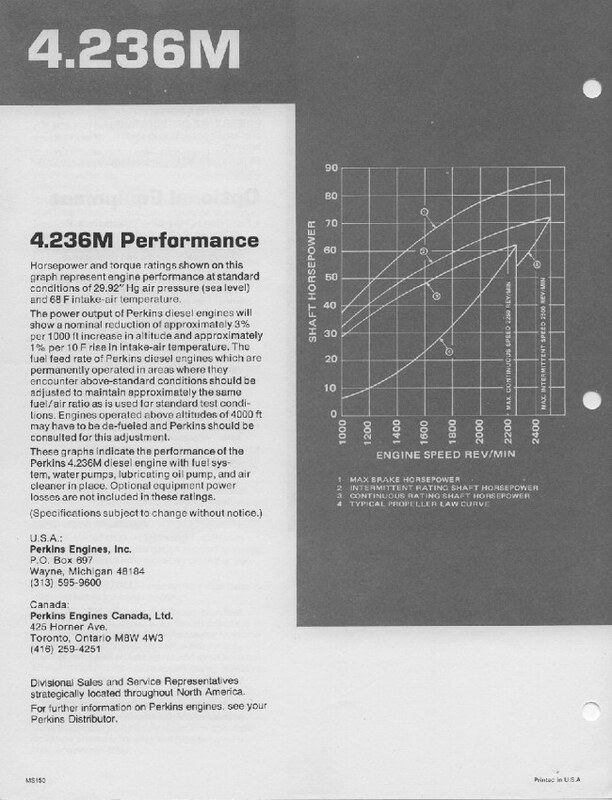 "All of the manufacturers of these anchors recomend them for boats between 33 and 38 feet in length..."
Test Series performed by the manufacturers of the Super Max anchor, not being enough accurate, in my opinion, due to the low number of tests performed and not rigurous enough method. The French Regulatory anchor tests. From the pages of Fortress anchors. "If you, like me, enjoy anchoring in those small, remote coves, you are sure to have dragged your anchor at some time : no matter what anchor you use, poor holding or strong winds will have made sure of that." (Alain Poiraud). Interesting tets series, where the setting ability of anchors on sandy bottoms was observed. Very interesting conclusions on instability of Flat Anchors. 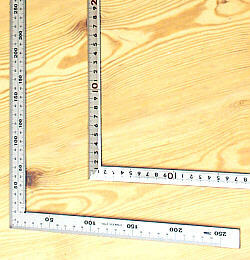 Comprehensive test performed by "When direction is reversed 140º. a third of the anchors never broke out, another third reset at some length, and two never reset". Well, having read down to here through all of the previous Tests reports, I feel somewhat confused. Anyhow I tend to trust the tests marked . To try to help fellowmembers of the Banjer 37 Motorsailer Club to make their own decissions on what anchoring tackle(s) should be better for Banjers use, I'll try to arrive to some conclusions, based on my own experience and knowledge, as well as on most welcome expected contributions from BMC members and friends. "The main and ONLY advantage of the chain is that it is the only and perfect mean to avoid chafing of the anchoring rode on agressive sea beds. Except for this point, chain has all the disadvantages..."
"If the chain splice is examined for chafe on a regular basis, we find no objections to the rope to chain splice from a strength reduction standpoint, as it appears close in strength to other components in the system and to commonly available nylon line." Notice that with a 63 knots wind (Superior limit for Force 11) the rode tension (equal to wind & waves force) acting on the theoretical typical 36' ketch, is only slightly less than the Bollard Pull estimated downwards in this page for a 27" diameter propeller (746 kg) in Banjers with the Perkins 4236. This means that even with full engine throttle, a Banjer would not be able to make a headway. In real life this is even worse at sea, because waves are really much bigger than those found when the Columbia River test, where fetch was (most probably) relatively short. The worst time for an anchor to drag is in extreme conditions. Those situations often occur at night, on lee shores or when a vessel may be surrounded by coral heads, breakers or other boats. So we have to calculate our anchor for the worst expectable conditions, let's say the top of Force 11, 63 knots winds, as we have to put a reasonable limit, unless wanting to carry something like an oil rig's anchoring system aboard. The tests we've seen upwards here, indicate that because most anchors do not perform well in rocky, kelp/weed-infested areas, a selection of suitability of bottom for anchoring, may be more important than selection of an anchor. Indications on nautical charts of bottom characteristics are very general. Investigation of holding ground is possible through experience and, if all else fails, experimentation. 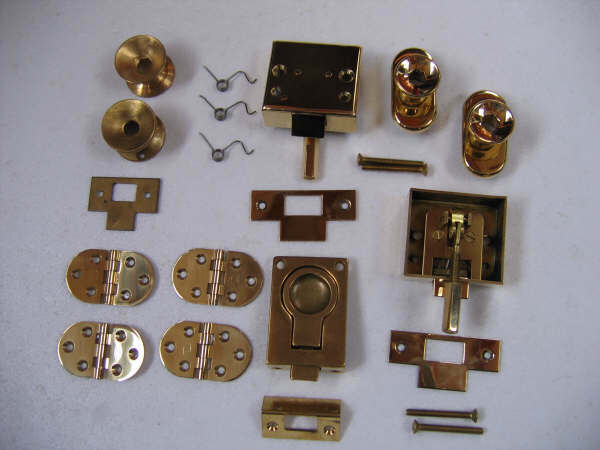 Since it is generally difficult to verify the quality of the set, the best insurance is personal experience with a given anchor design and its suitability for specific bottom conditions. We know now what kind of forces our grounding tackle has to withstand. Now, how can we calculate what is needed for our Banjers? I'll try to follow some recommended methods, commonly used by the boating and shipping community. But first we may have a look at the web sites linked inmediately down here, as I find they are helpful stuff to simply calculate the anchoring tackle, as well as having very interesting info. Detailed information from the manufacturers of the Flook anchor. Although rigurous, is easy to follow. Includes an useful nomogram, the 'Anchor Computer'. From Al's Software Sailing Page. Most useful. Most probably all you need to know about anchoring calculations, although some simple maths are required. You may download from there several useful spreadsheets, allowing you to simulate your rode configuration. Down here you'll find a link to download his Synthetic Formulae spreadsheet. They also state the following: A “Lunch Hook” should be able to hold your boat in a 15 kn breeze. A main, or “Working Anchor” should hold up to 30 knots of wind. A “Storm Anchor” is for winds up to 42 knots. And now let's put to work. 1.- Following different Rules and methods. (CQR, Delta, Bruce, etc., and the like). Chain shall be at least equal to one boat length long, and total rode at least 5 boat lengths long. So, allowing for some margin, let's say that for a 36 footer, like Banjers, we should use, as a minimum, a 20 kg high holding power anchor, with 12 m of 8 mm chain and 48 m of 12 mm nylon rope. From here you can go up to the sizes your experience (or fear!) dictates. Now the recomendations from the ABYC (American Boat and Yacht Council). The table express the recommended holding power in pounds. 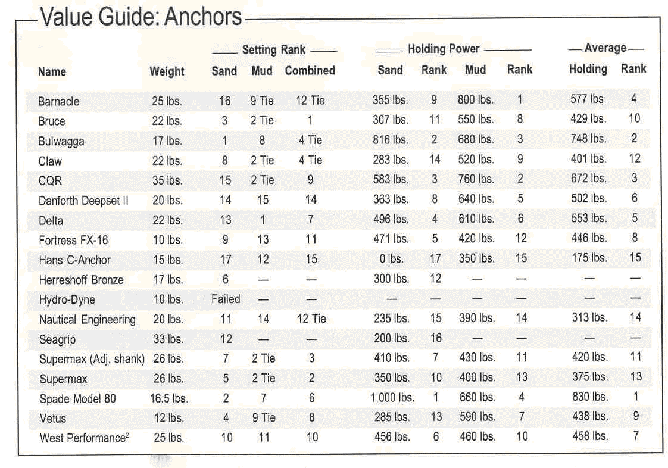 From the pages of BoatUS, where you'll find more useful info about anchoring. Comparing this with the upper Bob Smith's analysis, where 1520 lbs were calculated for a 63 knots wind, indicates the ABYC seems to be somewhat conservative, as I've also read about at some cruising forums. But, at sea, to be conservative increases your security and, on the other hand, I'm not so sure about Bob's data interpretation, as well as not knowing the wind force used by ABYC for Storm conditions. For a 20 kg (43 lbs) steel anchor and a 8 mm chain (weighing 1.15 lbs per foot), as those recommended in the Spanish regulation, we should use 11.4 m (37.4 feet) of chain, more or less one boat length for Banjers. The Spanish chain's length reccomendation seems to be quite adequate, according to this, but asks for a too short total rode length, according to Boat US. I believe Spanish authorities are taking in account the almost universal recommendation of letting out a rode length of about 5 times the depth, for "standard" anchoring. Among the cruising community there is a simple rule many folks used to talk about: "You need a main anchor weighing 1 pound per waterline foot". So, for Banjers with a waterline length of about 31.17 feet, we shoud go for a 32 lbs anchor. I find this number not really enough at all for Banjers, as my own 'working tackle' with a 33 lbs Admiralty anchor has proven inadequate on sandy bottoms with strong winds in the range of Force 6. Confirming this, numbers obtained with the calculator mentioned in point 4, suggest that my working tackle will not withstand winds in excess of 20 knots (Force 5). 1.4.- Calculations using Al's Anchoring Tackle Calculator. a) All chain rode: 3.5º rode angulation at anchor. 8:1 scope, 21 kg minimum anchor weight. b) Mixed rode for a 0º angulation: 20 kg anchor, 50 m chain, 22 m nylon rope. Static mode tension for 63 knots appears at the calculator to be 650 daN (663kgf), which coincides pretty well with the upper Bob Smyths analysis (689 kgf), although data there is said to include waves effect (?). Dynamic overtension with mixed rode goes in Al's calculator up to 1430 daN, and with all chain rode staggers to an incredible 3251 daN. The data taken from MARIE, with a 20 kg CQR, 50 m chain, and the adition of 22 m of nylon rope, as well as using the 800 kgf rode tension, indicates that the boat is able to withstand winds of 47 knots, the upper limit of a Force 9, with a 0º rode angulation at the anchor, which is more than enough for my usual sailings. If we calculate with 1430 daN, we arrive to the needing of a 30 kg anchor and 58 m rope, in adition to the 50 m chain, for a 0º setting. Note: Author says he consider CQR, Danforth, Bruce, Britany, etc., "classic" anchors, and Spade, Brake, Bügel, Delta, etc., "high-holding" ones, for which a 30% reduction in weight can be considered. 1.5.- Calculations based on Banjers wind profile and Phil Dunhulty's Nomogram. I have been doing some preliminary work with this Nomogram, but numbers for Banjers move in the limits of the curves and I am not sure about anchors efficiency index. Not enough trustable information about this indexes, in my opinion, is posted at Dunhulty's web pages. But making efficiency index equal to 40, which seems to be a fair index for high holding power anchors, I arrive to an anchor weight of 22 kg for a 63 knots wind, so not so far away from other methods. But lower efficiency indexes call for heavier anchors. I've written a letter to Dunhulty asking for help. Let's wait. 1. The answer to your first question is yes, certainly you may extend the graphics. What more can I tell you. When I read Phil's article I asumed these data were not good enough to use them in the calculations, I recognize. I thought they were only indicative. I find dispersion of values too big and probably they are not comparable. I think it's risky to say, i.e., that 30 is a mean value for CQR anchors, when dispersion of values goes from 9 to 70 (!). And if we have to asume this kind of enormous variation, How can we asume 34 is a trustable mean value for Danforth High Tensile's? Well, but using anyhow these data, and assuming for a 45 lbs (21 kg) CQR anchor an efficiency index of 30, we come to the conclusion that it's holding power, as per the nomogram, should be around 500 kg in sand/mud, which is not enough to withstand the Force 11 winds we are working with. We should go for a bigger one or either use some other anchor with a higher efficiency index, but which one is that one? We cannot say it from Phil's table, except for Danforth High Tensile and Flook, so, as I told before, those data are not trustable enough, in my opinion. Next days I'll try to extend Phil's curves to the zone of what is needed to work with the input data we are considering here, meaning this data for Banjers, and post the result here. 1.6 What for Hurricane conditions? This is really a huge tension, much more than that those obtained from Bob Smyth's analisis or the ABYC rules (1920 lbs). Using Al's calculator for a 11 m boat in 10 m depth, good seabed holding, 1.5 m bow and a ground tackle using a mixed rode of 15 m, 10 mm chain and nylon, to obtain a dinamic overtension (due to wind and waves) of 3026 daN for mixed rodes, we need to introduce in the calculator a wind of 92 knots instead of the 75 considered in Van Dorn's calculations. So, we can realize the difference among both methods. Van Dorn takes into accoun the Displacement and Al's calculator takes Length, which may be the cause of the discrepancy. With the preceding data, following Al's calculator to handle a 92 knots wind, (Assuming a rode angulation at the anchor of 8º), we need an anchor of 35 kg, as well as 70 m nylon rope in adition to the 15 m chain , to get a 6:1 scope. "...However William van Dorn in "Oceanography and Seamanship"; Dodd, Mead (1974), presents a graph based on calculations for anchoring oceanographic vessels in storm conditions (?). It suggests that the optimum chain/nylon combination for anchoring vessels < 50ft. in 30 ft. of water under storm conditions is a 20% chain, 80% nylon rode with an overall scope of 6:1. Assuming that the boat's bow chock is 6 feet above the water and that the waves are 4 feet (8 feet peak to trough = 2.4 m) this works out to a 240 foot total rode comprised of 48 feet of chain (14.6 m) and 192 feet (58.5 m) of nylon. Clearly these are extreme conditions. In shallower water the rode could be reduced proportionately. However, the length of chain required approximates one boat length and a good working rule for a combined rode is a boat length of chain plus whatever nylon is required to give a 6:1 scope. In shallower water, the scope should be increased, within swing limitations, to 7:1 to permit the bow to lift more easily to the choppy waves near the shore". Now let's have a look on what a reputable Classification Society states for Yachts and Boats under 24 m length. Warping ropes: 2 of 15.6 m and 2 of 10.4 m, 18 mm nominal diameter, same rope as before. - Both anchors may be on chains or on lines with chain outboard shot. - Main anchor weight may be reduced 25%, to be used in inland waterways where strong currents and high seas can be excluded, in our case 16 kg. May be substituted by an Stock anchor of 1.33 the weight of the main anchor, in this case 21 kg again. - The chain may be substituted by 49 m of 22 mm three branded nylon rope plus 6 m of 8 mm outboard shot chain, shackled to the anchor. Rope line must have a spliced-in thimble at one end. - Anchor chains and chain outboard shots must have reinforced links at the ends. - A swivel is to be provided between anchor and cable. - The chain has to be made fast to the boat in a quick release safe operating manner, with fastening strength being no less than 15% but no more than 30%, of the normal breaking load of the chain. - Do not stow near heating appliances. - From time to time inspect them carefully for external and internal defects. - Replace defective thimbles. Splice-in loose thimbles afresh and seize-in firmly. My interpretation on this two anchors scheme is that we could use a working tackle with a 18 kg anchor and 49 m of 22 mm 3-strand nylon rope, plus 6 m of 8mm chain, for good weather anchoring, ready to be made fast in line to the main 21 kg anchor with the 32.5 m of 8 mm all chain rode, when strong winds, even up to hurricane forces, are expected. Something to ask Germanischer Lloyd (??). Both anchors should be fast setting ones. With the working tackle as said before, we could handle 40 knots winds (The top of a Force 8) in a 10 m depth anchorage, which is good enough for most ocasions. The extra diameter of the nylon rope of the working tackle is needed to be able to withstand the force in a hurricane, when deploying the two anchors, working both on this rope. Well, but I realize we, most of mortals, do not face hurricanes often, so probably we could use a little bit of more chain, let's say 12 m, and a lighter rope, of let's say 16 mm, (much more handable but still with more than enough resistance) for the "normal conditions". When we expect things may deteriorate to really heavy conditions, then we should add the main anchor and substitute the 16 mm rope for a 22 mm one. To allow for corrosion, etc, I'd go for an all around 10 mm chain, instead of the 8 mm recommended. 2.- What do manufacturers recommend for a 36 feet heavy boat? Here you have the information from some well known anchor manufacturers. Some of them enter with weight of the boat, rather than length. Bruce: Storm, 13kg; Working 6.5 kg; Rope: 15 mm; Chain: 9 mm; Minimum chain length: 6.5 m; Anchor shakle: Pin diameter: 10,5 mm, Body diameter: 9 mm. Spade: Model 100, 20 kg (steel). For boats with LOA < 50', Disp < 12 tonnes. Flook: 10 kg (22 lbs); 3 strand Nylon rode, 13 mm. Shackle size: 12 mm. Fortress (30 knots winds): FX 16, 4.5 kg / 10 lbs. Nylon rope, 13 mm; 4 m chain, 8 mm; Shackle, 8 mm. Their commercial sites, some of them with interesting info about anchoring and anchor tests. 1.- Some of those recommendations seem to be quite low for serious cruising, from my point of view, as we've seen before. 2.- Interesting to find that Danforth and Fortress, the two anchors more prone not to reset after breaking away on sandy bottoms (as per the tests upper mentioned in this article), are the only ones to advert the wind velocity in their anchor chooser (20 & 30 knots, respectively), just telling you have to be cautious for higher wind velocities. Sarca: Sarca Anchor Nº 7, Galvanized (25 kg / 55 lbs). Leader chain, 13 m of 12 mm. Stainless shackle 12 mm. Manson Supreme: No recommendations available at the web site. Interesting to find that the manufactures of all these "new breed - high holding" anchors, except Oceane's, recommend a weight in the range of of 20-25 kg (44-55 lbs), also in line with Spade's and Buegel's. "Older" plough/claw type anchors like Bruce, Delta, CQR and the like, recommend (see upwards) weights in the range of 16 kg (35 lbs) or less, which seems to be not enough at all. So the "high-tech" guys, who talk about special surfaces, chisel blade tips, balanced weight and the like, finally go for a much more conservative weight recommendation than manufacturers of the less sofisticated anchors (!!!). I like this approach, meaning to me that although a good design is important to the performance of an anchor, weight is also a fundamental parameter not to forget for an all around one. This anchor has had very good results in Sail Magazine 2006 Anchors Test, with an extraordinary holding power. From SAIL magazine: "Quick sets and multiple 5,000 pound pulls at 5:1 scope proved it worked beautifully everytime"
Its setting characteristics are not based in weight (neither total or tip's), but in attaining always the right position because of the floatation bubble. They reccommend their model Standard 45 for a Banjer like sized boat. No anchor is designed to hold well in all kind of bottoms. For serious cruising you should carry two or three types aboard. 3.- My practical suggested method to test your anchor weight and type: 'Bollard Pull' test. Here you have something interesting to do this season! As we found before, a Force 11 wind will impose the rode with a force more or less equal to the Bollard Pull of a 27" propeller in a Banjer mounting Perkins 4236, as a rough approximation. So, you could take your beloved Banjer to a convenient and isolated location, with a 3/5 mts depth firm clay (**), mud or sand bottom , with no boats around, in a calm day. You should look for a bottom as horizontal as possible, with no weed. Don't test in very soft mud or clay, as most anchors don't hold well (Unless your anchor is specifically designed for this job, as the Fortress at 45º), neither in a hard clay, dense sand, weed or gravel/rocky bottoms, as your anchor may not set, penetrate adequately or bending at the flukes. Firmly dig your main anchor by means of short bursts of power (you may visual check it with the help of a tender in clear waters). Let out 25/35 mts of a 13 mm+ nylon rope plus 10 mm chain (at least one boat length of chain), making it strong to both rear cleats of the Banjer by means of an 'Y' strong rope connection. Slowly open throttle up to 2250 rpm for Perkins 4236 or around 1700 rpm for Perkins 6354 (If you go all the way up with this engine, you'll be exercing a pull in excess of 900 kg, which makes a more demanding test) Then slowly veer the boat 30º to each side. If the anchor holds, or moves but not breaks out, this could be one to take with you for an extended voyage. If it doesn't hold, or fails to reset, you'd better use it only under trustable conditions, as a Lunch Hook or a Working Anchor, depending on its performance. Try several locations and tests on the same kind of bottom, if possible, to find mean conditions. I kindly ask members to perform this test with their own Banjers, whenever possible, and let me know the details and results. (**) Firm clay may be defined as the one on where your thumb will penetrate several inches with moderate effort. 4.- Rode: Chain, Rope, Shackles and the like, from other sources. The following are typical maximum working loads for common chain sizes. Working loads are assumed to be at maximum a 25% of breaking load. Numbers are approximate and may vary from different manufacturers. Equivalencies among metric and imperial units are approximate. Numbers in bold highlight what should be the minimum choice for Banjers. BBB short link or "calibrated" chain is required for use with anchor windlasses with chain gypsies. It is important to match the chain and gypsy. Nylon double braid or 3-strand rope should be the material of choice for anchor rodes. Braid is more susceptible to chafe than 3-strand, but coils better in the anchor locker and resists much higher loads. On the other hand 3-strand stretches more than the double braid and has better chafing-resistance properties. You may also use an 8-strand rope ("square" rope), but although with good chafing-resistance and working load properties, elasticity is poorer than 3-strand.. Numbers in bold highlight again what should be used for Banjers. Shakle, Chain connecting links, Swivels, Anchor connectors, etc. - For the shakle, recommendations are to use one size bigger than chain. So, if you go for a 10 mm chain, you should use a 12 mm shackle. Use drop forged, deep galvanized, load rated models. A 3/8" one will have a WL of 1 Ton, while a 7/16" one will go up to 1.5 Tons. - You should be careful with chain connecting links as they may be weak. Check their breaking strength. If in doubt, it's easier and simpler to use a proper shakle when gathering lengths of chain is required. Always respect the one size bigger rule. Never use "quick link" type shackles, as they are not designed for this job. - Be careful also with swivels design and breaking load. Get sure they resist as much as the chain, at least. They really do not work properly under high loads, but will take turns out of the chain in most normal situations. - The same about stainless steel anchor connectors. They are nice looking and easy the passage of the anchor connection through the bow roller, but they tend to be weak in real life, many times with a breaking load being a fraction of that of the chain. Check it. Nylon will chafe, so you'll need to make good chafing gear. You may use a combination of heater hose, head hose, and fire hose about two feet long, as used by Jim Hughes on board his 50' Irish Mist, to protect a pair of snubbers used in between the rode and the boat, to absorb the chafe specially in storm conditions. You shoud never trust, for serious anchoring, a rope rode working on the bow roller. If you have an all chain rode, use 13+ mm 3-strand snubbers secured to the rode by means of a rolling hitch or chain hook, lead them through the fairleads protected by the chafing gear, and make them fast to bollards or strong cleats. Although original Banjer's windlasses are strong stuff, dont let the chain or rope working on them. Again: Use the snubbers. This will also take away the irritating noise of rode's chain against the bowsprit's chain. In fair weather I'd use only one snubber, leaving the use of two for storm conditions (In this case with rolling hitchs, not chain hooks). Please send me your contribution. I'll gladly post it here. You may do it by e-mailing me or posting it at the Forum where a dedicated thread has been opened. You may do it in english, dutch, french, german or whatever other language. Thanks in advance. In principle, a good anchor must first and foremost hold, and ideally increase its holding power as forces incur heavier loads on the vessel... but in order to hold, an anchor must first deeply penetrate and set in the various types of seafloors. There are two types of setting: static and dynamic. - Static Setting: Almost always followed by dynamic setting, this setting is typical for cargo ships, where the anchor, from several hundred to several tons of pounds, sinks into the seafloor from its sheer weight alone. No extensive research has been carried out regarding effective setting for these circumstances. In terms of small craft navigation, we can find a similar static setting with the plow anchor, which they don’t manufacture under 15 pounds, simply because anything lighter could not function. Anchors which are not sufficiently heavy may only offer cursory holding in more compact or weedy seafloors, but they might be very effective in soft mud. - Spatula: Plow anchors, once resting on a hard surface, assume a “spatula” angle with respect to the seafloor. Once the tip encounters a softer spot, it embeds by measure of its own weight to its upper apex, thereby assuming the “chisel” angle, which allows the anchor to completely embed. As previously mentioned, on a compact or weedy seafloor, the plow remains in its “spatula” angle, without setting. - Scraper Angle: Anchors such as the old FOBs, with a bulky hind portion, tend to do a “handstand,” alighting on their flukes. At this point the flukes meet the seafloor almost perpendicularly, raking the surface without setting. - Chisel Angle: Three principle examples of this are the Bruce anchor, the German “Bügel” anchor and the SPADE. All three approach the seafloor at an angle superior to 90 °, up to 120 °. These anchors have the reputation for rapidly setting in a majority of seafloors. - Razor Blade Angle: This angle, superior to 150°, is typical of plate or articulating anchors. They necessitate contact with a sand ripple or soft area for their fluketips to pierce the seafloor surface; they then assume the chisel angle and set. On compact or weedy seafloors, these anchors shave the bottom without taking hold. - Setting Pressure: Pressure is defined as force divided by surface area. Here, we have two variables: force (daN or Lbs) and surface area (mm² or sq inches). The force must be as high as possible and the surface as small as possible to maximize the pressure. A number of anchors have sharpened setting edges, as do the Fortress, FOB THP, the Bügel or the Spade. The distribution of weight in the fluke tip makes sense in anchor design as it facilitates setting. We can see a great disparity amongst fluke ballasting in various anchors: The fluketips of flat anchors and the CQR comprise between 12 and 16 % of the total weight of the anchor, while the ballasted tip of the Delta contains 28% of its total weight. - The... SPADE anchor... 47% of its total weight in its point. We can see that an anchor will tend to set more easily in the seafloor when it launches with the appropriate penetration angle coupled with the maximum pressure on its fluke tip. Just a diagram illustrating the relative differences between tip-weight and setting forces. There is a great deal of confusion about the concept of "tip-weight", in part due to some manufacturers who maintain that a large amount of tip-weight is required to properly set an anchor. We feel obliged to point out that while some tip-weight is important, it does not need to be all that high. You are welcome to use this graphic on your website. Just for your information, I just discover the following web page made by one distributor of the Spade anchor.. I just took a look over your webpage on Anchoring once more, and thought I could contribute some more material for you. - The SAIL and Yachting Monthly testing, which I think you are aware of, we host on our website (see "independent reviews"). You may like to link to. One 45 lbs CQR with 100 m 14 mm rope, as a secondary, stern and back-up anchor. One 33 lbs (15 kg) Fisherman style anchor, with 12 m galvanized steel 8 mm chain and 40 m, 13 mm double braid nylon rope. I use it as a working anchor for good weather, low depth, day anchoring; either in sand, mud, weed, gravel or rocky bottoms. Not really trustable with Force 6 gusts on sandy bottoms. I extensively use it in Galicia's summer time, as it is easily and quickly brought back aboard by hand only, even if well digged in sand/mud. Very useful with weed, rocks and gravel bottoms, always using the compulsory buoy/retrieval line. But you have to be very careful about not dropping chain/rope -or veering around- over it, as it gets entangled very easily. What do I miss, after all this reading and fussing? Well, today, 23.01.2005, I think I'd need to add 30 m of 14 mm nylon rope to the main ground tackle, to be able to withstand the worst of the winds expected in my area, sailing season and sailing behaviour, let's say if I get caught anchored in a Galician beach summer's night anchorage when a sudden SW front arrives with gusts reaching almost Force 10 (Most unprobable!). If I were to go globetrotting, then I'd go for a higher holding power, strong anchor and 70 m of 14 mm double braid nylon rope in adition to the 50 m chain. But I still have to do more thinking, perform some testing with my own (and friends') equipment, as well as hearing from fellow BMC members. Then I'll let you know within the next 'Conclusions' point. 8.- Conclusions. What should we use on Banjers? A selection of books on anchoring (Links to some webplaces where to buy them. This is only a facility for BMC members and friends. BMC does not have commercial interests with the linked sites, nor endorses them). - The Complete Anchoring Handbook, by Alain Poiraud, engineer and inventor of the Spade anchor. I will explain here my experience with my own good old MARIE, and try to give some advices. Banjers are 30+ years old boats and they have been maintained in a variety of conditions. Talking to other Banjer owners, I've found 'osmosis' problems ranging from absolutely zero problems to fully blistered hulls. Banjers do not seem to present more or less hydrolysis problems than any other boat from the same period with a similar level of maintenance. Don't trust simple readings with moisture meters taken just from the hull's surface. They may mean nothing even if showing a top of the scale reading. If blisters show up, ask for the professional opinion of a highly experienced surveyor. Don't trust self-proclamed 'experts', but look for good third parties' references. Now let's go into matters, from my own experience with good old MARIE. "Osmosis is one of the processes by which water is absorbed into the laminate and it can be and is reversed when the vessel is left to dry out on the hard. 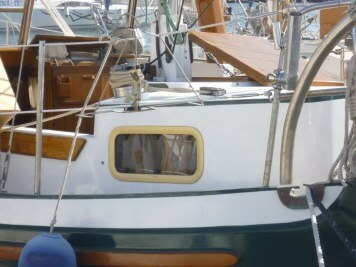 The word is, however, among the boating fraternity, aided and abetted by the popular yachting press, usually and totally incorrectly used to describe gel coat blistering formed as a result of the chemical and structural break down of the resin matrix as a consequence of water absorption whether this is by true osmosis or not." (Jeffrey N. Casciani-Wood). Notice on this hull how the blisters run along a band about one foot below the waterline. Also note how they appear in clusters lower down on the bottom, and that some areas between clusters are not affected. Examples like these prove once and for all that blistering is not merely a function of material, but also a matter of the quality of the layup. 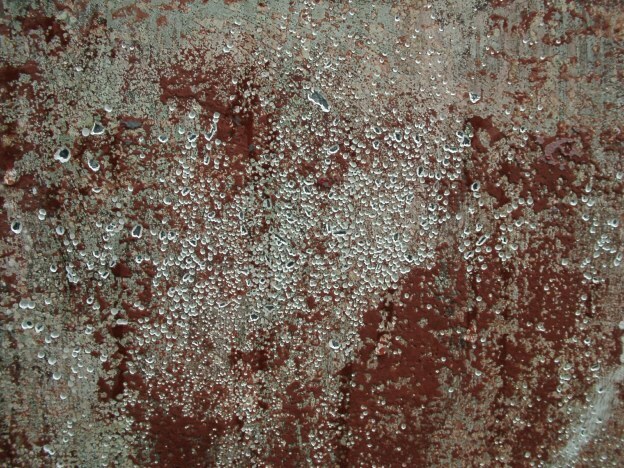 On this boat, the areas of blistering are not random but area-specific and directly related to permeability of the laminate due to imperfections. Once again, the skin out mat was found to be poorly saturated. Right photo contrasts the dry mat against the fully wetted out structural laminate. As you can see MARIE's blistering occurs under the same pattern considered in the upper information from Marine Surveys' pages. See the blisters aligning about one foot under the sea level. It happens on both sides of the hull. It may reveal inadequate craftmanship at the time of laminating, raher than poor quality of materials. Blistering probably had its origin within the glass layers just after the gelcoat, where mats/rovings were not properly embebbed with resin, leaving voids where water/acid accumulates by chemical reactions and osmotic pressure. Blisters were of the Type 4 explained at Jeffrey Woods Marine's pages, so being big and relatively flat. I've treated these blisters one by one, rather than peeling off the gelcoat. Damaged laminate was removed to find sound material, and then epoxy filled, sanded and painted. Damaged zone was found to be at most a couple of milimetres depth and there were no apparent bonding problems among glass layers, with internal laminate showing a good aspect. Marie's hull was 31 years old when the repairing work was done. She lies afloat for the whole of the year at sea, with water temperature in the 12 - 17 ºC range, which is a demanding condition for a GRP hull. Measuring MARIE's hull water content with a Tramex Moisture meter, I've found the hull to be completely water saturated. The instrument hit the top of the scale the whole underwater hull around. Water content in GRP hulls is not by itself a problem, except for the added weight to the boat, wich in Banjers is not great deal. The problem arises when this water finds residual products from the laminating process accumulated in defective workmanship's caused voids, so initiating the resin's hydrolysis process and subsecuent blistering if close to the outside surface. The bonding between the 520 Roving and the adjacent layers seems to be defective. The cause may be the woven-roving being poorly resin saturated or the next layers being laminated after some time after the first ones cured. Further laminating may have not bond properly to the previous layers. Because MARIE's hull was laminated in 1971, among other 20+ Banjers, I'd rather go for the first explanation: A poorly saturated layer. Another possible explanation could be inadequate control on premise's temperature when the laminating process took place, being it too low or humidity too high, but I'm more convinced by the poor saturation explanation. This defective woven-roving layer is what is causing blistering. On the good news side, the internal laminate seems to be in quite a good condition, through what can be checked at bottom openings and blisters repairs. I have been advised by my local expert, to peel off the first layers of laminate whenever possible, allow or force the hull to dry properly, and then rebuild the eliminated layers with vinylester resins and glass mats, and apply a final top-coat paint. Something to carefully study and program for when my economies allow to. 2006 and 2007 showed no needing for further treatments. Not any other blisters were found. Marina staff "2005 present": Gelcoat pitting damage! At this yearly MARIE's bottom maintenance works, I decided to remove the old antifouling paint before applying the new one, because too many layers were already one over the other, as well as to check carefully for blisters. The guys at the Marina decided to do the job with the high pressure water machine, at a close distance, instead of scrapping, as I asked for. The results in some areas is what you can see in the photograph up here: Extense zones of damaged gelcoat presenting thousands of small "pitts" some of them even reaching the under laminate. A real mess! (Not to talk about enviromental contamination!). When GRP oldies come out of the water after being there for a long time, the gelcoat is saturated with water, because old gel coats are quite microporous and become even more under permanent inmersion. A gel-coat like this is quite weak, specially if it is too thick: The high pressure of the water jet is enough to force water through the micropores and breake the gel coat, taking it off following the photographed pattern. So, when you see your Marina/Workshop's kind and efficient men approaching your boat with the water jet, you'd better check what they are doing! 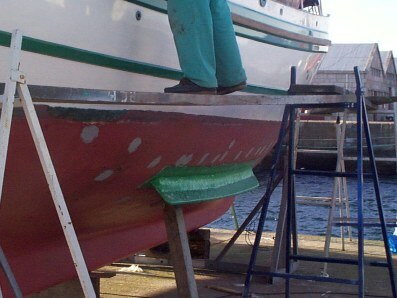 DON'T USE HIGH PRESSURE WATER JETS TO REMOVE ANTIFOULING! If any of you has also suffered this problem, please comment at the Maintenance Forum, as there is an specific thread posted about this. "The affects of hydrolysis on the resin, however, are of more concern than blisters..."
HAVE BEEN LOOKING AT THE ARTICLES ON THE WEBSITE ABOUT OSMOSIS TREATMENT ON OUR BANJERS. I HAD DUCK SOUP TREATED/REPAIRED IN AUSTRALIA IN THE MID 1980S & IT FAILED. IN 1990 I TOOK DUCK SOUP TO NEW ZEALAND TO BE TREATED/REPAIRED BY MIKE MENZIES. NEARLY 15 YEARS LATER I CAN VOUCH THAT DUCK SOUP IS THE ONLY BOAT IN THE RPYC MARINA THAT IS POX FREE. I THINK YOU ORIGINALLY FOUND DUCK SOUP & MYSELF THRU THIS WEBSITE. THERE IS A LOT OF RELAVANT & INTERESTING INFORMATION ON THIS SITE. THREE ARTICLES FEATURE DUCK SOUP AS A SUCCESS STORY FOR BOTH MIKE MENZIES & DOW CHEMICALS. SUGGEST YOU ADD MIKES WEBSITE TO OUR SITE & ALSO INVITE OTHER BANJER OWNERS TO VISIT MIKES SITE. THE SUCCESS OF MIKE’S TREATMENT IS HIS METICULOUS ATTENTION TO THE HULL PEELING, THE NEARLY TOTAL ELIMINATION OF MOISTURE FROM THE HULL & THE USE OF THE LATEST MATERIALS (VINYL ESTER IN DUCK SOUP’S CASE} FOR THE REBUILD. THIS IS A TIME CONSUMING PROCESS & INCORPORATES THE USE OF A CLIMATE CONTROLLED SHED, HEAT & IF NECESSARY, VACUUM BAGGING IN CONJUNCTION WITH HEAT. MIKE WORKED ON DUCK SOUP FOR ABOUT NINE MONTHS – IT WAS WORTH THE EFFORT! BANJERS' HYDROLYSIS / BLISTERING FACTS & PROBLEMS SOLVING, by Guillermo. 1.- Banjers are 30+ years old boats. If a Banjer has been kept most (or all) of its life afloat, and a proper hydrolysis treatment has not been already done, the hull laminate will be saturated with water (which is not a problem in itself) and some kind of hydrolysis/blistering has to be suspected, if not already evident. 2.- Blistering is a consequence of hydrolysis processes taking place close to the surface of the hull. 4.- Banjers kept ashore for the autuum-winter season (either in cold or hot climates), most probably won't have developed any kind of hydrolysis. 5.- If blisters appear in the hull, first check if they are in the outer layer, or if they affect the interior layers (As is the case of Marie, related upwards in this page) by opening some with a sander or wood chisel, before proceeding with repairs. This will give you a clue about the necessary deepness of repairs. 6.- Hydrolysis fluids exiting the laminate, reduced resin and glass fiber clarity or reduced resin hardness, even with not blistering showing, indicate a most probable hydrolysis of the internal layers . 7.- Deep laminate hidden hydrolysis is worse than surface blistering. 8.- Letting the hull to dry in open air, even with gel-coat peeled off, does not by itself eliminate glycols, acidic spots, etc. from the internal laminate, as well as does not solve eventual delaminations already caused by hydrolysis. Just heating does not eliminate glycols because of their high boiling temperature and nothing solves delamination problems except taking damaged layers off. Not even applying hot and vacuum only. 9.- Hydrolysis in a Banjer -If present at all- most probably is affecting only the outer layers of the laminate, two to four of them at its most. The rest of the laminate should be in fairly good condition. 1.- Peel off all the old gel coat, even if it seems in good shape and no blisters appear. 2.- Check for hydrolisis fluids exiting the laminate. 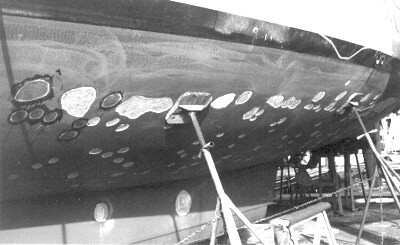 Do some testing, sanding or chiseling off the outer three-four laminate layers, in several small locations around the hull (You may use actual blisters spots if they are present), to check for internal delamination and adecuate transparency & hardness of resin-fibres, in order to evaluate if you have to remove the outer layers or not, and how many. 3.- REMOVE, with no remorse, all damaged layers (if any), till you find sound laminate. 4.- Let the hull to dry naturally under a cover in a well ventilated shell or outside with a polythene skirt taped around the waterline, and wash it at least once a day for a week to ten days with hot fresh water to remove eventual propylene glycols. Drying time will vary from case to case, but in most cases four to six weeks is enough. Hot and vacuum systems may be used at this stage to accelerate the process. What is important is to remove glycols and acidic breakdown products out of the laminate. Take also your time to eliminate all water from the bilges and check the inside laminates there, for possible internal hydrolysis (Unusual, but depends on how much time water remains in your bilges usually). 5.- Never, never use propylene glycols to accelerate water elimination from the hull! 5.- Re-laminate whatever has been taken off, using vinylester resins and good quality fiber mats. 6.- In case only very little glass (or nothing at all) was necessary to have been removed, because layers were mostly OK, don't be shy and laminate an extra outer layer of a 600 gr/m2 mat, using vinylester resin. 7.- Apply an outer barrier of 0.75 mm vinylester resins (You'll need up to six rolled coats for this). Alternatively you may use solvent free epoxy for the first coat and then either solvent free or solvent content epoxies for the subsequent coats. or hire the services of a professional to do them as recommended here. As per calculus at Boatdiesel.com. No other suggestions using practical gear ratios. All are acceptable - but the lighter the row color - the more efficient the prop at this boat speed. by some members who's Banjers mount the Perkins 4236. They inform about higher motoring speeds than predicted. They state around 7 knots at 1500 rpm, and around 6.0 knots, at 1300 rpm, clean hull, calm waters. higher speeds than static Lwl formulae predicts, can be obtained. All other info & feedback from members about this, will be greatly appreciated. by some members who's Banjers mount the Perkins 6354. They inform about higher motoring speeds and less consumption than predicted. and around 7.0 knots (1.100? rpm) with an approximate 6 Lt/Hr consumption. Interesting stuff about the propellers and speed. I have done some propeller calculations for the Banjer with a Perkins 6.354 M engine. I did 2 runs, one with 86 hp at 2400 rpm and one with 50 hp at 1500 rpm. The calculations give speed, propeller diameter and pitch, shaft diameter and bearing distances, required for the shaft. As you can see, the speed difference between 1500 rpm and 2400 rpm is only 0.4 knots. We run normally at 1500 rpm and it gives us indeed 8 knots of speed. The program I used for this calculation is a program designed by MARIN, the Dutch famous towing tank. I used this program a lot for calculating propellers for various tugs, workboats and small freighters and it is pretty accurate. You will find both calculations enclosed. (text files, can be opened with notepad)I hope you will find this of interest. Down here you'll find calculations results. From them and from Maarten's real experience, we may say Banjers seem somewhat overpowered with Perkins 6354. We need only around 50 BHP (DIN) continuous power to attain 8 knots which is a really high speed for Banjers (Also confirmed by Ton's experience). We still have to check out what the real propeller's diameter and pitch are in Banjers with Perkins 6354, to figure out its performance. If any of you know yours', please tell me. The propeller is calculated with the next data. And now Maarten sends same info for the 4236 engine, you'll find down here. It's also evident the small increase in velocity (Only 0.3 knots) from 1500 rpm, 42 HP, and 32" propeller, to 2250 rpm, 61 HP, 27" propeller. As with Perkins 6354, a reason for the small increase in velocity is because we are moving in Froud's numbers above 1.34, a zone where big increases of power bring only small increases in speed. As before, we may say also that Perkins 4236's 61 HP is somewhat an excess of propulsion power, considering only the needing to sail at a reasonable fuel consuming speed, what probably is around 7.5 knots for our Banjers (At most. I'd rather say 7!). For this we only need around 40 BHP and a nice propeller. But to allow for enough margin to cope with rig's windage and beating ability through head winds and seas, more power is needed. From my point of view, the 61 BHP of Perkins 4236 seems to be quite a good approach. Banjers with Perkins 4236, rpm / speed data. MARIE's measured (2005) propeller diameter is 27.56" (700 mm). Pitch, approx. : 18"
Calculated slip for this propeller is around 22%. Shaft: Inox steel AISI 316, 50 mm diameter. Similar rudder stock. as Marie's engine has a limiting speed top at the lever in the injection pump (Saving money device!). 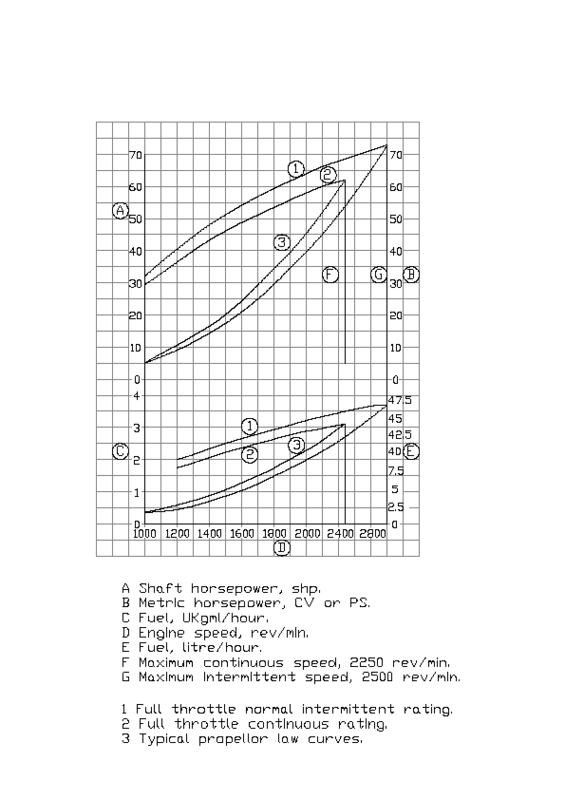 KITTYHAWK's rpm-speed table, checked summer '04 by Dees, with no wind or currents. Guillermo's speed measurements up to 1500 rpm, coincide pretty well with Dees'. Alfred von Werdt, former MARIE's owner. We are not sure about our interpretation of those curves. So, talking again about what should we understand as enough 'headwind beating reserve of power', we've found upwards in this page (when talking about anchoring), that the load imposed on Banjers with a Force 11 wind, is around 700 kgf. Bollard pull for the 27" propeller studied upwards is in this range, and around 500 kgf when motoring at hull speed. So with this engine-propeller combination we have, theoretically, enough power to withstand a Force 11 wind in protected waters, but not make a headway through it. As things in real life are somewhat more complicated, because of inertias, wind shifts, unknown effects and the like, I'd say we have enough power to reasonably handle a Force 9 in protected waters with no waves. I'm by no means saying you can dance the Swan Lake's Overture with your Banjer, but saying you have enough power to help you manouevring in those conditions, if you have been forced into them. Banjers with bigger engines and propellers have more power available and would be able to cope with higher forces, but would you cope with the situation? The instabilities caused by the enormous and variable exterior forces acting on boats in storm conditions, are higher than those one can really handle under engine, even in flat waters. When motoring through a headway in a long passage with wind and waves, you are supposed to slow down your engine's rpm and even alter course, as you'd be imposing high overloads on the propulsion system if you don't. You'd also be imposing excesive punishment to boat and crew, as an inadequate waves encountering period may bring high accelerations. Nothing but your own experience can tell you what your Banjer, you and your crew limits are and what's the adecuate speed and tactic to asume in a particular condition. This is the point were theory gives up and seamanship comes in full command. In real life you'd not be just motoring through a headwind gale, unless in a last effort to enter a narrow harbour's entrance, or the like. When in open waters, If conditions still allow for it, you'd rather be motorsailing. That's when Banjers better show their abilities. Open the rhumb out of the wind as needed, set the proper combination of sails just to dampen down movements and as a help to keep an steady course, gently push with the engine at an adecuate rpm to better cope with waves' encountering period: That's the best tactic. If waves are high, you may also adequately steer at the passing of the crest as needed. I've safely done this kind of motorsailing with a full Force 8 and 2.5 m waves. Of course, if conditions deteriorate, you'd may be obliged to look for shelter, run the gale or hove to. Just a final note: When motorsailing in strong conditions, be careful if the boat is heeled to port. Most Banjers mount the raw water engine's intake on the starboard side and, although mounted in a deep location, aerating of the refrigeration system has been referred by fellowmembers, this conducing to overheating of the engine. A situation you wouldn't like at all to be. I'd most appreciate you posting your comments & experiences on this matter at the Forum. On the 19 th august we (Sprot,Damy III,Argo) sailed on the Haringvliet with a windforce 7 becoming 9 with moments of 10. At 1600 rpm we made 6.5 knots (wind from port in the lee of an island) when the Kittyhawk decided to sail against wind and waves (it was force 9 by then) the speed slowed to 4.4 knots. When we increased to 1850 rpm it was 6.4 knots. I checked: the tide was falling. 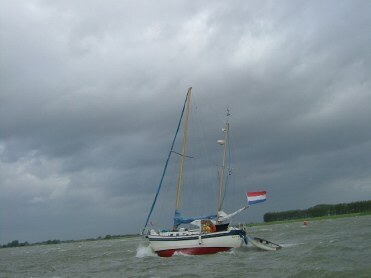 But we had the tide direct from port side when sailing to Middelharnis. So only a part of the stream may be counted. On the other side the wind was against the current, normally the current is zero in circumstances like 19 th august..Our companions said they sailed at the Spui with the wind and current in the back at10 knots over ground.The Spui is a narrow kind of river with 2.5 knots current. Concerning the heeling: Kittyhawk has long masts and extra ballast weight. In the severest moment of the storm with windgusts of force 10 the heeling was for only one moment as far as the gunwhale. I did not check the angle by then,because there were other things to take care for. During the trip I often thought about what I had read in the Perkins instructions: The engine can operate up to 30 degrees heeling. From time to time I checked. It never went over 25-28 degrees. Concerning the motoring speed in a head storm: We have not a high pilothouse, so only the hull, the rolled genua, the two masts, the covered sails and the sinking dinghy count. The only trouble we had were: Sinking dinghy and self emptying holes blocked by hair from my daughter, water came slowly in the centercockpit because of construction of the mark3 of the Banjer. When the hair was taken out we had only the sinking dinghy. 6.4 knots seems to be an excellent performance when motoring against a Force 9 (gusting 10) gale, indeed! Let's say we are talking about an steady 45 knots wind: Calculated windage force for this velocity is around 350 kgf for Banjers, as we've seen before. Supposing the propulsion system is using part of its power to counteract this windage, and making some simple estimatives, we have, at most, a remaining 275 kgf available from the propeller, to make a headway. This is at the engine's maximum of 2.250 rpm. At 1850 rpm it would be something like 165 kgf, as per a quick estimative. This force seems not to be enough to bring the boat up to the mentioned 6.4 knots even in no wind/calm waters. We need around 40 HP at the engine's end for that. The estimated 165 kgf, if at 6.4 knots, would had make only for around 16 HP at the engine of an hypothetical boat smaller than Banjers. So, probably, although Kittyhawk's crew was measuring a full force 9 at the top of the mast, the mean wind velocity acting on hull, superstructure and rigging, was less than that. A safety margin for all of us to keep in mind. 06-05-2006: We got Perkins 4236M HP- rpm curves! We got the HP-RPM curves from designer Tad Roberts, in Canada. Pay a visit to his pages to find out his very nice state-of the-art-technology classic-style designs. Unluckily there's not an specific fuel consumption curve in the above diagram. If you have any useful data regarding this matter, either for Perkins 4236 or 6354, or any other engine, please send to Guillermo. Thanks in advance. MARIE's data indicates 1300 rpm (6.0 kn, clean hull) is what can be considered as the best fuel-efficient / passage time ratio speed. More precise fuel-consuming data from this Banjer will come after some checking next months. Measuring fuel consumption for a certain speed is not so easy, except for long passages with stable calm weather, or if you have a fuel-meter, which is very uncommon. Distances measured over the ground, not through the water. At the end of the season both tanks are filled completely, so consumption is easily checked. An hour-count-clock is installed connected with the engine, it is new and works well. 2003: clean hull, trips on sea with 1600 rpm. 2004:clean hull,only one trip on sea. 2005, clean hull also, maximum speed reduced to 1350 rpm, due to homokinetic problems. Every year the Kittyhawk is put in a heated building and the hull is cleaned. We always use 1400-1600 rpm as we have to sail on rivers and estuaries with currents. Minimum is 800 rpm in a port. Maximum 2400 is never used (Above 1800 is rarely used). In the beginning of the season we stay on the river Maas and the lakes that are connected to it. We visit small harbours, have to wait for locks,anchor here and there. In the holyday we make the long trip to sea, via the river Maas and the Zeeland estuaries. But in the Netherlands there are always bridges and locks to wait for. You have fun, it gives you other things to think about, and it brings adventure and gives a happy feeling. Expensive girlfriends can have the same effect, but you cannot sell them at the end. As an Extra, they cost at least half you own. A mean speed of +/-4.5 knots may indicate, as Dees explains, plenty of time spent in harbour maneouvres, waiting for canal locks/bridges to open, etc. or, on the other hand, experimenting counter currents most of the time, which is most unprobable. To be in accordance with speed, the mean engine's turning speed seems to be have been more in the range of 1000 rpm, than in the 1400-1600 Dees relates for sea/canal passages. With 1500 rpm, KITTYHAWK should have had averaged, in the flat waters of Dutch canals, something like 6.7 knots. So, Dees dissapointing is sensible. As also are his comments on boats and girlfriends! Dees is reducing consumption in lts/hour (3.8, 3.5 and 3.14), and at the same time is increasing the efficiency (Miles per liter: 1.15, 1.31, 1.33). The cause of this is the progressive reduction in top speed, with engine's rpm coming down from 1600 to 1350. That supports the appreciation that the most efficient cruising speed for Banjers with Perkins 4236 is around 6 knots, which corresponds to 1.300 - 1350 rpm (Kittyhawk's engine and Marie's are not exactly the same, although being both Perkins 4236). All this is related with Speed/Length ratio, which at 6 knots is around 1.06. Authors as Robert P. Beebe, whith an extensive experience in long motoring ocean crossings, recommend a cruising Speed/length ratio around 1.10 which corresponds quite well with what we are finding. Comparing 2005 with 2003, we also realize that losing only 0.18 knots in average speed, Dees saved 12.2 lts of fuel every 100 miles, or around 110 lts (!) for a whole 900 miles typical sailing season. So, 6 knots ( Maybe 6.5 at its most) seems to be the speed at which Banjers should move when under engine alone, to be fuel and time efficient in long passages (Nor too slow, nor too high fuel consuming). I think I have to complete the use of fuel for 2007 for the records. The figure for 2008 unfortunately are not for use , as we used our sails a lot. It seems the same as in 2004. We had a lot of long trips with 1600 rpm as well on inland waters as on sea. Friend Kjell Dahlberg, in Mallorca, kindly sent curves with Perkins 4236 consumption data. These data are an estimative. Clean hull, calm seas. Note that coming down from 2000 to 1000 rpm (half of it), almost tetra-plicates the range (550 to 2025 miles). Yo will do the same 1000 miles in 167 hours (7 days) at 6 knots (1300 rpm), but you'll use only 583 Lt.
Again the same 1000 miles in 189 hours (almost 8 days) at 5.3 knots (1100 rpm), using 453 lt. .......I said I would give you accurate speed figures: they have turned out not to be as high as the first ones! According to the engine data the fuel consumption will be 3.5 l/hr at 1200 rpm, 5 at 1500, 7.5 at 1800 and 10 litres at 2000. We think the wheelhose is now much quieter but that is subjective. Generally I am pleased with this - and I now have the old 27" x 19" prop wrapped up under a saloon bunk - just in case a nasty Hebridean rock jumps out! 1.- Measure diameter of propeller "D"
2.- At a point of one of the blades situated at 2/3 of D, use a framing square (You can easily make one by yourself) to form a triangle being Hypotenuse the blade's rear face, as shown in figure. Carefully align the framing square, making Side 2 parallel to the propeller's shaft and Side 1 perpendicular to it. You should get your propeller's pitch quite approximate if measures had been obtained carefully. Displacement to LWL: A medium value would be 200. 300 would be high (Heavy Cruising Boat) and 100 would be low (Ultra Light Displacement-ULDB). Boats with low numbers are probably uncomfortable and difficult to sail. Hull speed = 7.48 knots as by static waterline lenght calculation. Tested aboard is around 8.5 knots. Hull Speed: This is the maximum speed of a displacement hull. Some racers and lighter boats are able to achieve greater speed by lifting over the bow wave and riding on top of the water,that is, planing. Sail Area to Displacement: The sail area is the total of the main sail and the area of the front triangle. A racing boat typically has large sail area and low displacement. A number less than 13 most probably indicates that the boat is a motorsailer. High performance boats would be around 18 or higher. Motion Comfort: Range will be from 5 to 60+ with a Whitby 42 at the mid 30's. The higher the number the more comfort in a sea. This figure of merit was developed by the Yacht designer Ted Brewer and is meant to compare the motion comfort of boats of similar size and types. Capsize Ratio: A value less than 2 is considered to be relatively good; the boat should be relatively safe in bad conditions. The higher the number above 2 the more vulnerable the boat. This is just a rough figure of merit and controversial as to its use.